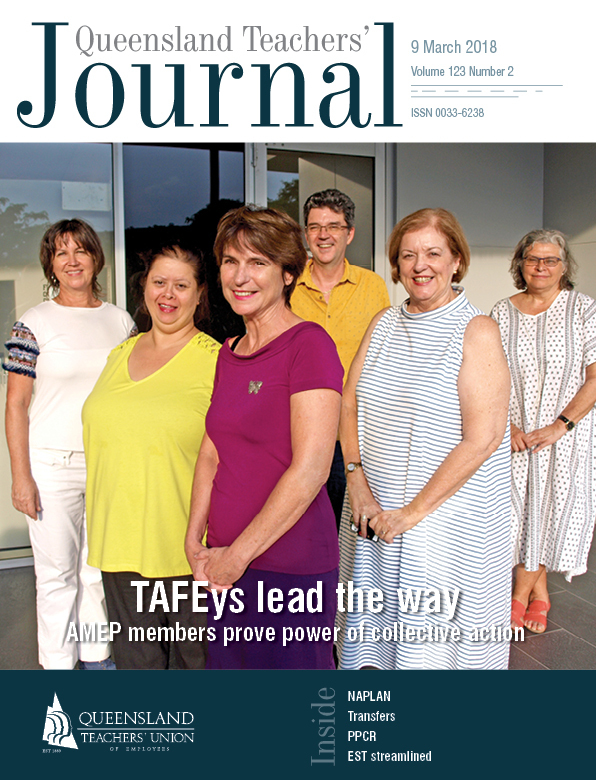 Solidarity and collective action has enabled AMEP teachers and tutors in Brisbane to persuade their managers to address their concerns over workload intensification. TAFE Queensland secured the Adult Migrant English Program (AMEP) contract from the Commonwealth in mid-2017. With any new iteration of a contract comes changes in expectation and funding level. However, unknown to TAFE Queensland, the Commonwealth Government’s changes in compliance expectations would be many and frequent, and significantly more onerous and unrealistic than the previous measures. Given a complete lack of clarity regarding the compliance measures, the Commonwealth is reported to have provided changes on an almost daily basis in the early stages of implementation. The unfortunate outcome of this was that teachers and tutors in AMEP would experience frustrations due to lack of clarity and workload intensification as attempts were made to implement the frequent changes. Faulty federal data and an absence of appropriate federally-provided compliance tools contributed to runaway workload and stress. Unrealistic expectations included accounting for student attendance in increments of one minute and teachers being required to calculate the total minutes of student attendance on a student-by-student basis, daily and weekly. Following initial months of ongoing workload intensification, members from TAFE Queensland Brisbane (TQB) raised the matter at the TQB LCC. Despite raising workload concerns, in addition to other matters related to the implementation of the new contract, AMEP members did not receive any positive outcome. Feedback from members at this time indicated that management were not listening to the workload concerns raised. Frustrated members sought QTU assistance, and a series of special interest meetings of QTU TQB English Language Migrant English (ELME) members was held. It was through these meetings that members were able to discuss concerns about workload and provide clear evidence of the failures of the system. This allowed QTU officers and key workplace representatives to form a broader understanding of the challenges arising from the new contracts as experienced by TQB English language educators, predominantly in AMEP. These meetings were entirely member driven, with attendance by members from across the Brisbane metropolitan footprint, from Caboolture to Logan campuses. While the QTU TAFE Organiser and Industrial and Research Officer were present, members ran the meetings. Members’ concerns were collated to identify common issues and a strategy developed to further them. Issues were then presented to TQB management at a special out-of-session TQB LCC sub-committee meeting. Again, this process was also member-driven by Workplace Representatives, albeit with the support and attendance of the TAFE Organiser in some meetings. What has been the result of this high level of member activism? Where management were not listening previously, following the special LCC meeting TQB management has taken some steps to address workload. This includes the development of automated electronic rolls, which should alleviate the intense workload resulting from the unsustainable practice of marking rolls several times throughout a lesson, and manually calculating the total number of hours attended by each student at the end of the day, and the end of each week. Has this action resulted in all the concerns raised by members being resolved? Not yet. There is ongoing work to be done. However, the interim outcome is an example of what happens when members unite in working through dispute resolution processes. Where it was perceived that management were not listening and/or actively addressing teacher concerns previously, there has now been remedial follow up action. Where previously some managers had suggested that there were no workload issues, members have been able to secure follow up action to address these apparently “non-existent” issues. It is collective action and the united position of members that has led to a response and remedial actions by management. This is one example of how QTU members actively and positively effect change in their workplaces every day.